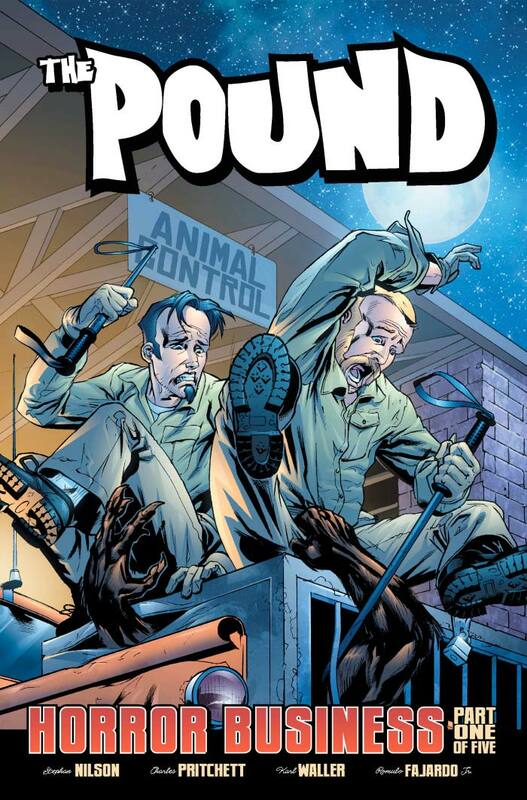 The Pound is an upcoming comic from Frozen Beach Studios about Cleveland Animal Control Specialists Scott Allison and Howard Lynch. The two have lost their jobs due to budget cuts and decide to start their own private stray animal retrieval business â The Pound. At first itâs business as usual â retrieving a mother raccoon and her newborn litter from a crawlspace or removing bats from basements but everything changes the night they receive a call about a large dog running loose in the halls of the high school. Turns out that itâs not a dog at all. I got a sneak peek at the first issue of The Pound and the comic definitely has the potential to be great. Iâll admit though that it does start out pretty slow, there were parts that I had force myself through, parts that were a bit too wordy and tedious for a comic. But eventually the pace picks up and you have yourself an interesting werewolf mystery accompanied by some fantastic artwork. The artist does an amazing job capturing the tone of each scene, which definitely earns The Pound some brownie points. The first issue ends on a huge cliff hanger, and itâll be interesting to see where the writers go with it. They can take it in a variety of directions, turning the comic into something badass. I hear that there will be some supernatural twists and turns up ahead, so weâll just have to wait and see what The Pound has in store for readers. Overall, The Pound is worth checking out. The beginning drags a bit, and some readers may have a hard time relating to the two characters, but as I said above, it definitely has potential. The Pound #1 will be launching digitally April 26, 2011. It will be available via the IDW iPhone/iPad store and the Sony PSP. It will be available in print this summer.